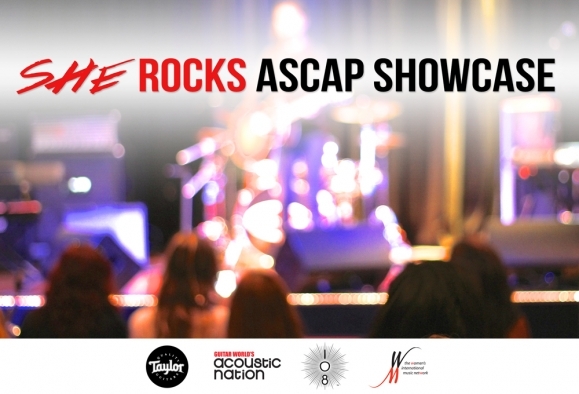 The Women’s International Music Network (the WiMN) announces the official 2015 She Rocks ASCAP EXPO Showcase scheduled during the ASCAP “I Create Music” EXPO in Los Angeles, Calif.
Now in its second year, the She Rocks Showcase will take place on Fri., May 1, 2015, from 9 p.m. to 12 a.m. in the heart of Hollywood at the Tinhorn Flats Saloon & Grill, across the street from the EXPO headquarters at the Loews Hollywood Hotel. The ASCAP Expo runs April 30 – May 2, 2015. The 2015 She Rocks Showcase presents a unique opportunity for female artists of all styles and ages to perform in front of industry experts, media representatives, artists, publishers and more during one of the most prestigious songwriting events of the year. “We’re thrilled to be able to offer this platform to female musicians from all over the world. I can’t think of a better place than the ASCAP EXPO for women to demonstrate their musical talents to top songwriters, composers, producers and industry influencers,” said WiMN Founder Laura B. Whitmore. Artists are encouraged to submit their best material for an opportunity to be selected for a performance slot at the showcase. All materials must be submitted by April 5, 2015. Showcase performers will be announced by April 8. Selected performers will also receive a free day pass to the ASCAP Expo. An EXPO badge is not required to attend or participate in the Showcase. The 2015 She Rocks Showcase is sponsored by Taylor Guitars, Casio, 108 Rock Star Guitars and Acoustic Nation. To fill out the submission form and for official rules and regulations, visit thewimn.com/ascapshowcase.